“Yes, we can do Aberdeen a big favour this weekend but then we play Aberdeen on Friday so we can do Celtic a favour,” said Ozturk. “I think we can help decide which team wins the title because we play both of them in the next couple of games and then after the split as well. But we can’t think about that. We have to battle with them both because, if not, our season is over as we have too big a lead over St Johnstone. If you want to show something you have to beat these teams so we will do everything we can to do that. So far they have drawn twice with Ronny Deila’s men in the league, and lost once, in the League Cup, while Aberdeen have managed to better them in both their previous Premiership meetings this term. They did manage to overrun Derek McInnes’ challengers in the Scottish Cup, though, proving that they are capable of making life tough for both teams and, with a game in hand on Aberdeen and with two head to heads against the Pittodrie side to come, they may still be able to overhaul the nine-point gap and end the season in second position. But they will have to bounce back from a poor showing against St Johnstone in the last game before the international break. Ozturk was a helpless bystander and admits it was painful viewing but, returning to the side, he says that game was a wake-up call and a reminder that every game is fraught with danger if they let their form dip. “You win four in a row with four clean sheets and everybody was flying,” he said. “We had a home game and we always think that Tynecastle is a hard place to come. But we lost goals from two corners and we were 2-0 down in the first half so we made it hard for ourselves. 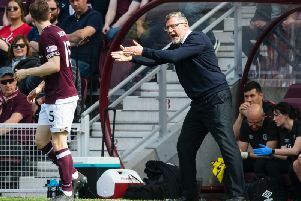 Some Hearts fans will rue missed points in the matches where standards slipped and the manager and players share that frustration, but they say that both of the sides above them will have their own regrets and Ozturk believes that the first season back in the top tier has given them something to build on as they seek to maintain their progress next term and run the leading clubs even closer. “You have to be realistic,” he added. “I know Hearts is a big club but we came from the Championship and two years ago the club was almost gone. He thinks that victories in these games will allow them to demonstrate how far they have progressed since Celtic were battering them in the cup competitions last term and how close they now are to pressing at the top next term. “Everything is different this year,” he said. “The way we lost that cup game, with the penalty for Celtic and the red card for us, was hard. If you get a red card against Celtic after ten minutes, good luck. It’s hard. But this year is different. We have new players and a new team and we are looking forward to Saturday. “The defeats against Celtic last season have been among the toughest to take of my time in Scotland. Celtic and Rangers are the biggest teams over here and they have big crowds and those games were tough. It’s always tough to play against those kind of teams.